Citing public safety pension costs, the city is expected to approve another increase to its property tax levy. Homeowners in the Lake County city of Highland Park may soon be looking at a second year of higher property tax bills thanks to pension costs. The coming increase is nearly double the hike the average city homeowner saw on this year’s tax bill. On Nov. 26, Highland Park’s City Council adopted a $79.7 million budget for 2019, which anticipates a $972,000 hike to the city’s total property tax levy to pay for pensions. In explaining the levy increase, city manager Ghida Neukirch highlighted that rising pension costs were crowding out spending on public services. “Continued pressure to fund public safety pensions is draining resources away from support of city services and capital investment,” Neukirch stated in a letter to the mayor and city council members. The addition of $972,000 to the city and library property tax levy represents a 5.5 percent increase from the adopted 2018 levy, going from nearly $17.6 million to $18.5 million. Highland Park is required in 2019 to contribute $5.7 million to pensions, but the city plans to direct $2.4 million extra to the plans to curb future cost increases. The city’s levy accounts for 7 percent of a resident’s property tax bill. The Finance Department estimates the levy increase will cost the average homeowner about $235 on next year’s property tax bills. That follows an increase of $123 for the average household in 2018, which was dedicated to public safety pensions. The total two-year increase will average $358 for city and library tax collections on a $500,000 house, which is just shy of the city’s median home value. Highland Park’s pensions account for the largest slice of city and library property tax levy: 36 percent. Pensions take up a larger portion of property taxes than do operating the city or library. Because the proposed property tax levy hike is greater than 5 percent, Highland Park is required to hold a public hearing before voting on the increase. The hearing and levy vote are Dec. 10. Between 2006 and 2016, Highland’s Park annual contribution to its police and fire pension funds quadrupled, from $1.7 million to $7 million. Despite a substantial boost in funding, the fiscal health of both funds continued to deteriorate. As of 2016, Highland Park had 48 and 52 cents of every dollar needed to fund its police and fire pensions, respectively, according to a 2017 report from the Illinois Department of Insurance. Municipal pension funds are required to be 90 percent funded by 2040 under a state law that went into effect in January, adding increased pressure on municipalities to raise property taxes. 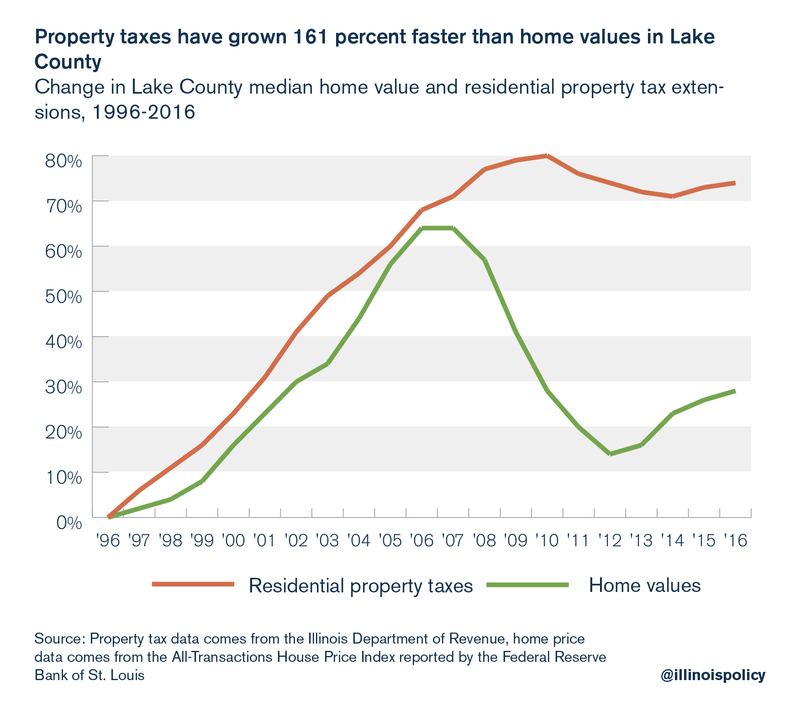 Across Lake County, property taxes have grown 161 percent faster than home values between 1996 and 2016, and face the highest property tax rates in the state. Unfortunately, Highland Park’s pension woes extend beyond just public safety pensions. Some former city employees see generous pension payouts, with 11 city and two park district retirees accumulating more than $1 million in total pension benefits. Four former employees of the Park District of Highland Park receive annual pensions that exceed $100,000. Highland Park is another example of an increasingly common pattern of hiking property taxes to pay for pensions. Norridge recently hiked its property tax levy by more than 35 percent to pay for police pensions. Likewise, Carterville in southern Illinois recently adopted an increase of 30 percent, also for public safety pensions, and Geneseo approved a 10 percent increase. Peoria, Rockford and Chicago face worsening pension crises. Defined-benefit pensions are imperiling government workers’ retirement security and jeopardizing today’s public services to pay yesterday’s pensioners, all while leaving taxpayers on the hook for ballooning costs. Lawmakers in Springfield must move to protect the retirement security of government workers and taxpayer interests. They should amend the Illinois Constitution to allow for changes to the growth in future, not-yet-earned pension benefits while protecting benefits already earned. Without a constitutional amendment, continual growth in unfunded pension liabilities will lead to further uncertainty for taxpayers, leaving municipalities hamstrung to fund public services.